CRY America Pittsburgh proudly presents the 3rd Annual Pittsburgh Holi Festl!! 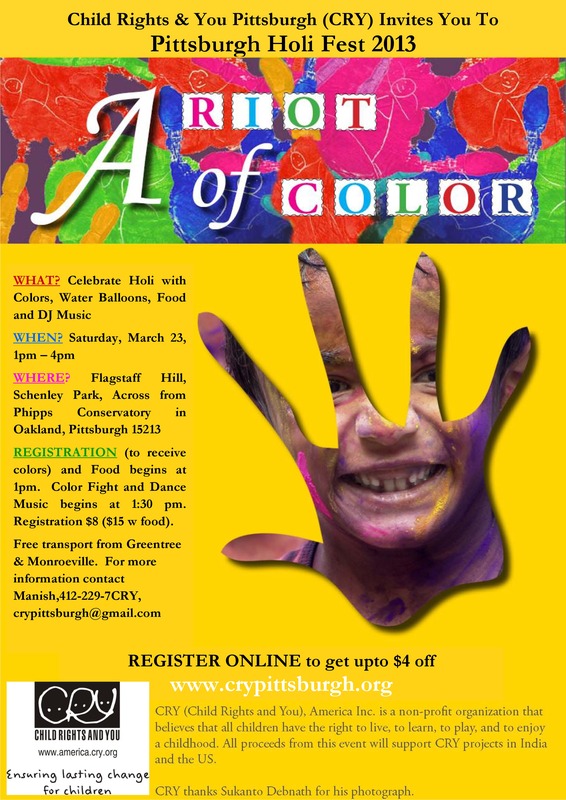 Come join us for a riot of colors! Event: Join us to celebrate Holi, the Indian spring festival of colors. Get ready for some color and water balloon fights with Bollywood music and awesome Indian food. All proceeds from the event will directly benefit child rights projects supported by CRY America. Come join us to paint the town red (all colors actually :-). Come dressed in white to show-off what others missed! Register Online before 11 PM on March 17 to avail upto 5$ off! So hurry!! For more information on the event contact Manish@ 412-229-7CRY. If you are interested in volunteering, Sponsorship please contact CRY Pittsburgh at crypittsburgh@gmail.com OR 412-229-7CRY. CRY America or Child Rights and You America Inc , a 501c3 nonprofit organization driven by its vision of a just world in which every child has an equal opportunity to develop to his or her full potential. In just 8 years of its existence CRY America has irreversibly transformed the lives of over 358,000 children living across 1,916 rural, tribal and urban communities through the support to 52 Projects. This impact was possible only because of the support that CRY America has received from over 15,000 donors and 500 volunteers, who have given so generously of their time and resources. The scale of impact that we have been able to accomplish in just 8 years fills us with hope and determination that with increased support we can reach out to many more children. You will be happy to know that 391 villages today have 100% children enrolled in schools, 886 government schools are now functioning where there were none and 372 villages are child labor free today because of your support. Hundreds of underprivileged communities were involved in this process of change. CRY America’s Pittsburgh chapter was started in July 2003, with 2 people. Today, we are a group of passionate and multi-skilled individuals dedicated to making a difference in the world! We are especially concerned about the situation of underprivileged children and want to do our best to restore to them their basic rights so they can be guaranteed a normal childhood. We do a lot of events in Pittsburgh to raise awareness and fundraising for supporting the various projects in US and India. CRY America’s strength lies in its supporters our volunteers, donors and project partners who have come together to change the situation of underprivileged children. Volunteers form the core of CRY America. They come from different walks of life university students, professionals, housewives, people working in various companies. Volunteers work among their colleagues, friends, family and local communities to create awareness about the situation of underprivileged children and harness resources each contributing in whatever way they can. You can help enable irreversible change in the lives of underprivileged children and ensure they enjoy their right to a happy and healthy childhood by joining CRY Pittsburgh. Volunteer: We are 100% Volunteer driven, register here to enable your journey with us http://connect.cryamerica.org/register/. CRY America is a 501(c)(3) registered organization, and all donations to CRY America are tax-deductible.